The Adair County Elementary School’s fourth grade students are pleased to have been named, out of hundreds of schools across the nation, the winners of the “Kids to Parks Day” national school contest. As a recipient of this award, the National Park Trust has awarded the ACES fourth grade with a $1000.00 scholarship to fund a day at a park. 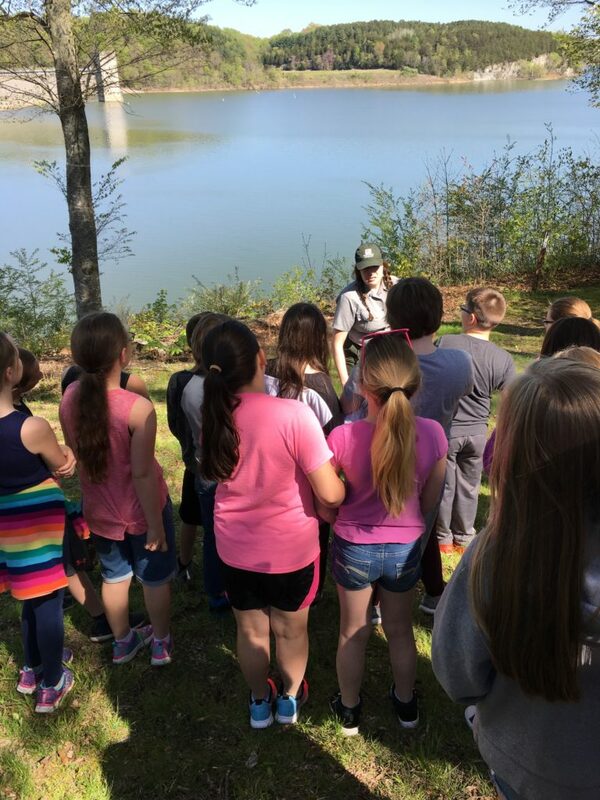 On Monday, April 30, 2018, the students visited Green River State Park, where they participated in a variety of learning activities including: Fish and wildlife; Guided tour of a Civil War cabin; Touring the Green River Visitor’s Center; Making crafts; Taking a nature hike; and Completing a service project (planting flowers at the park). All of this was made possible because fourth grade teachers, Jeana Pike and Jason Curry, wrote a grant and submitted student essays written in their classes expressing why a trip to a park would benefit the students. An overall winner, Ms. Bailey Coffey’s essay was chosen and submitted with the grant. Congratulations to Ms. Bailey Coffey, teachers Jeana Pike and Jason Curry, and the entire fourth grade! And, many thanks to the National Park Trust whose generous scholarship provided a fun-filled day of learning for our fourth graders. ACES students listen intently as a park ranger provides guided tour.